Student protesters crossing Grand demanding change and justice. On Sunday, protesters marched down Grand Blvd. after Jason Stockley was found not guilty in the killing of Anthony Lamar Smith. 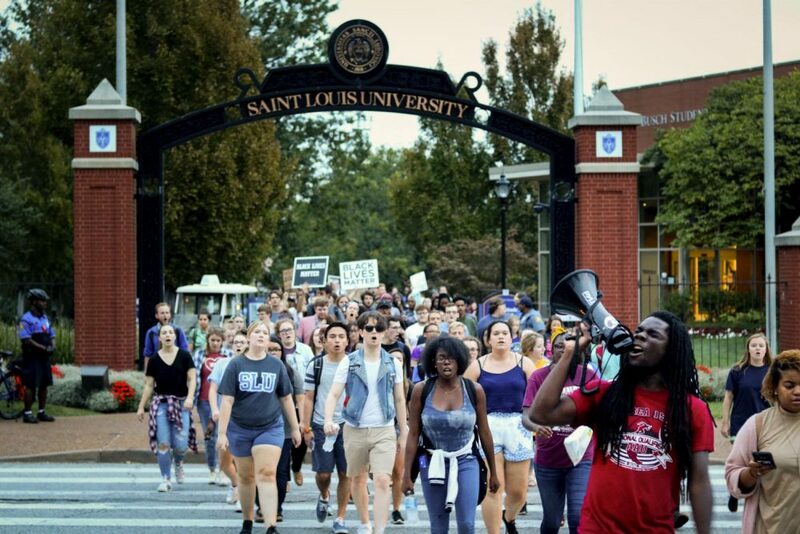 As they marched towards Saint Louis University’s campus, police blocked the entrance to West Pine, only allowing university students to pass, and the larger protest moved on. Student demonstrators marched on towards the Clock Tower and through the Busch Student Center, eventually stopping at the plaza between the BSC and the Science Quad. 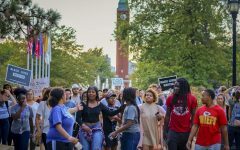 It was here that SLU’s President, Dr. Fred Pestello, met with students about the racial climate on campus. The verdict was announced on the morning of Friday, Sept. 15. Since then, many students have participated in demonstrations promoting justice. Last year, Stockley was charged with first degree murder after the killing of Anthony Lamar Smith in December of 2011. Following a high-speed chase through the north part of St. Louis City, Stockley killed Smith with five shots at point-blank range. Stockley has been criticized for many actions that occurred that day. Criticisms include the fact that he was armed with a personal AK-47 rifle, which is against St. Louis Police Department policy. During the chase, Stockley yelled, “I’m gonna kill this mother f—–, don’t you know it.” Forty-five seconds later, Smith was dead. Several video recordings from building surveillance, the in-car police camera and bystander cellphone footage captured the event as it unfolded. St. Louis Post-Dispatch coverage of this video evidence is posted at the end of this article. Police allege that Smith was armed, though forensic tests found only Stockley’s DNA on the weapon. The prosecution argued that Stockley may have planted the gun in the car, following the incident. Video evidence shows Stockley return to the police SUV moments after the shooting, rummage through a duffle bag and return to Smith’s car to sit in the driver’s seat where the gun was later discovered. Since the verdict was announced several days ago, it has prompted hundreds, perhaps thousands, to take to the streets over the weekend and into this week. Locations across the city from downtown to the Central West End and The Loop also saw demonstrations characterized by marching, organized chants and speeches by activists and community leaders. One such speech by Rev. Clinton Stancil, Senior Pastor of the Wayman AME Church, explained part of the strategy of the weekend’s protests. On the steps of City Hall, Rev. Stancil explained how protestors could grab the public’s attention by disrupting the regional economy. “You kill our children; we will kill your economy. We will kill your profits,” Rev. Stancil announced through a megaphone on Friday. Tensions with police have been high throughout the last several days. Kevin Nevels, a 45-year-old black man, tried to get through to a black police officer in full riot gear outside the police academy on Friday. “I know you’ve been racially profiled; I have too,” Nevels told him.